The Steven M. Still Perennial Garden features a 5500 square foot extensive display of multi-season perennials, shrubs, and small trees. It was designed by world-renowned English garden designer and plant expert Adrian Bloom. 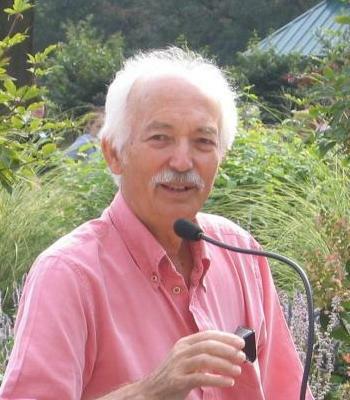 In August 2007, the garden was dedicated to honor Emeritus Professor of Landscape Horticulture, Dr. Steven M. Still, who is currently Director of the Perennial Plant Association. During his twenty-five years at Ohio State, Dr. Still mentored, lectured, advised, and nurtured more than 4,000 students. He is the author of the widely used Manual of Herbaceous Ornamental Plants and was the first director of Chadwick Arboretum & Learning Gardens. World-renowned English plant expert and designer Adrian Bloom designed this diverse and colorful entrance into our Learning Gardens. Adrian visited the garden two months before the scheduled planting to view the site and to formulate an overall concept. 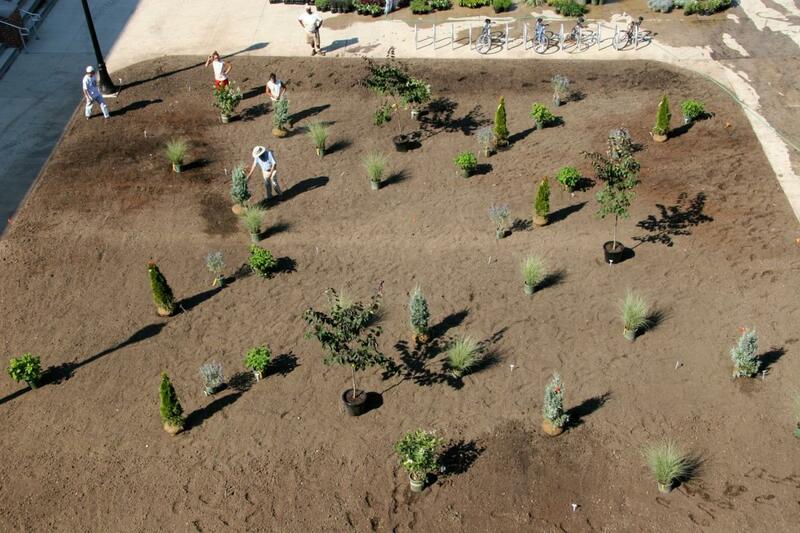 On September 7, 2005, Adrian led the one-day installation of this garden. Many partners, including the Perennial Plant Association, Blooms of Bressingham, area growers, industry professionals, and over 120 Master Gardener Volunteers and Chadwick Arboretum Volunteers, donated materials and helped with the installation. One view features Rozanne geranium (Geranium 'Rozanne'). This perennial geranium is a Blooms of Bressingham signature plant and flowers from early summer through autumn. It creates a river of blue through the garden. Planted along the sides of the river is Midwinter Fire bloodtwig dogwood (Cornus sanguinea 'Midwinter Fire') which develops brilliant red stems in winter. 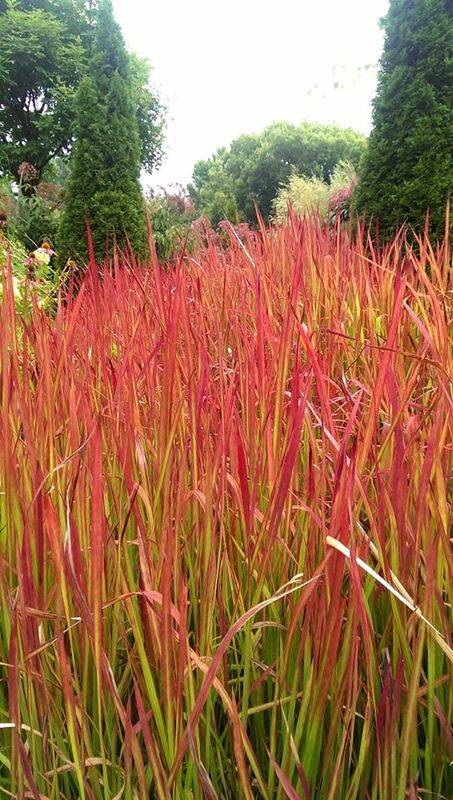 The contrasting garden river features Red Baron Japanese blood grass (Imperata cylindrica 'Red Baron'). In the autumn, the blood grass turns a brilliant red. 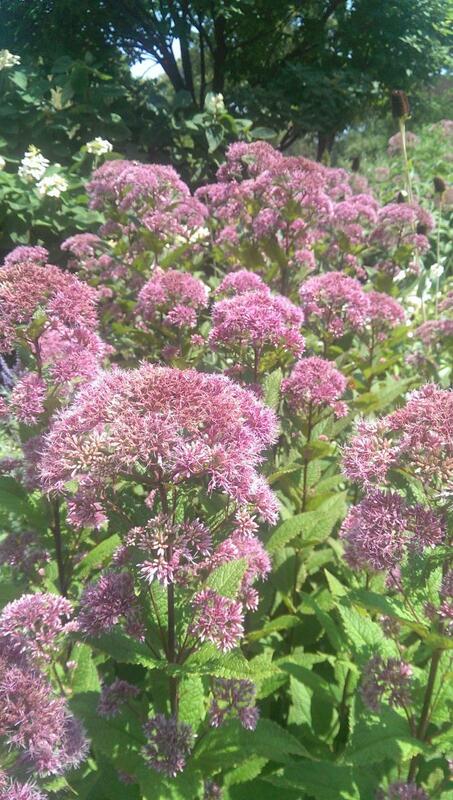 Matrona stonecrop (Sedum 'Matrona') and Annabelle smooth hydrangea (Hydrangea arborescens 'Annabelle') are strategically planted along both sides of the grass river to provide repetition that helps draw the eye through the garden. 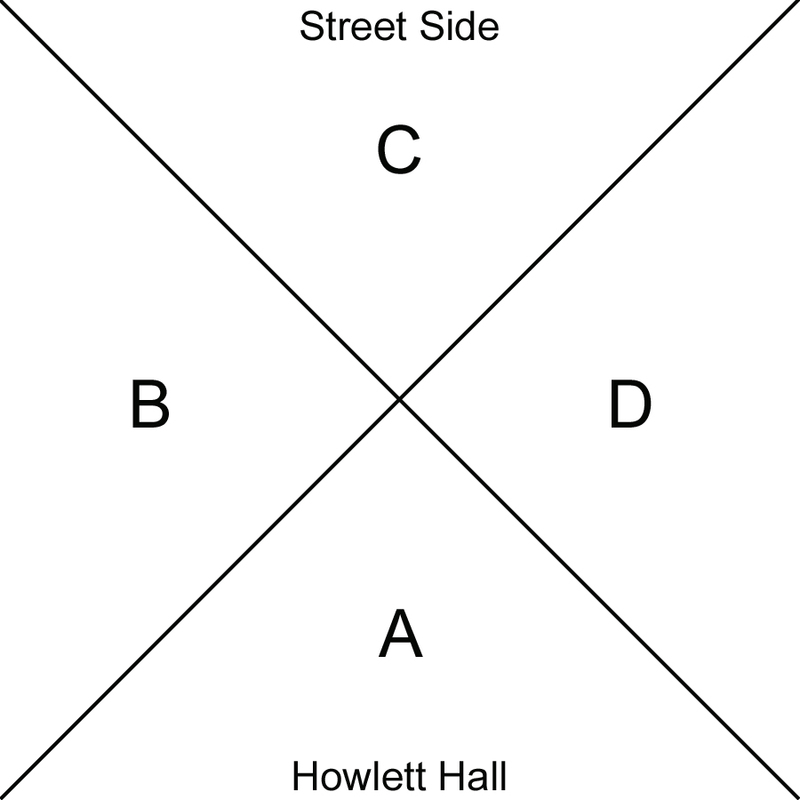 For the best view of these river features, stand at one corner of the square garden and look toward the opposite corner. Then, move to one of the other corners and view the other river. Both are surprisingly different. Although few home landscapes could accommodate a garden of this size, there are numerous attractive plant combinations that can be used in a smaller setting. 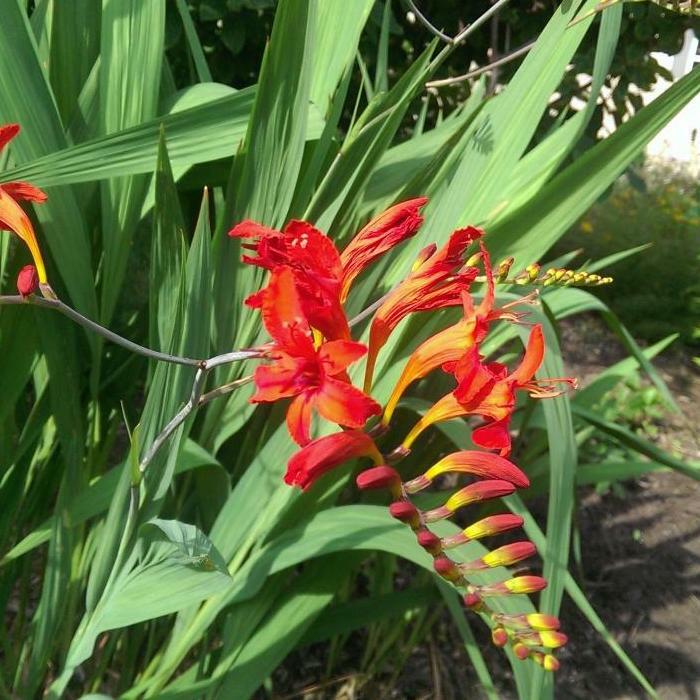 The following describes some of the Learning Gardens' staff favorites. 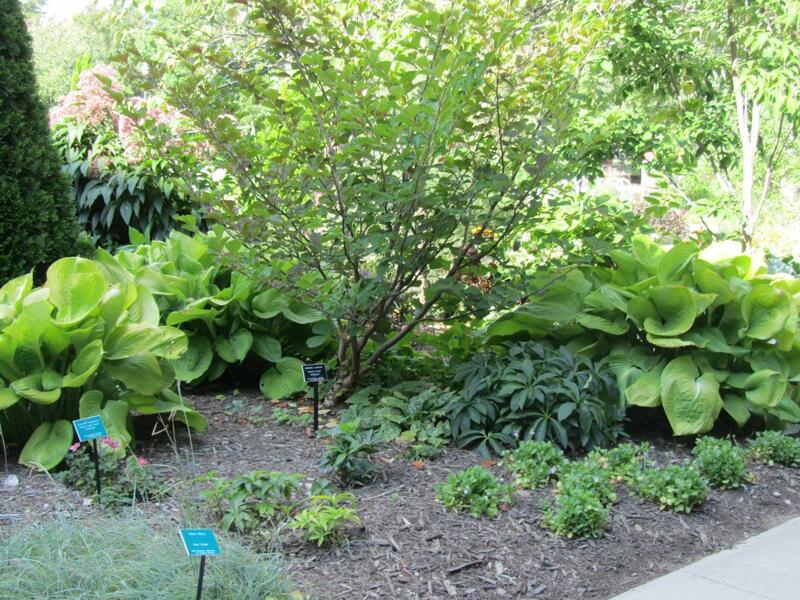 This section of the garden features plants that prefer shade to part shade. The purple foliage of the forest pansy eastern redbud (Cercis canadensis 'Forest Pansy') works beautifully underplanted with brunette cimicifuga (Actaea simplex 'Brunette') and the silver leaves of Siberian bugloss (Brunnera macrophylla 'Looking Glass' and 'Jack Frost'). The finely cut purple foliage of brunette cimicifuga also mixes well with the bold yellow leaves of sum and substance hosta (Hosta 'Sum and Substance'). The purple color scheme is successfully carried over by underplanting the greenish-purple foliage of smokebush (Cotinus coggygria 'Royal Purple') with a short purple coneflower (Echinacea purpurea 'Kim's Knee High'). A yellow and blue color scheme is created with yellow-flowering threadleaf coreopsis (Coreopsis verticillata 'Zagreb') and great coneflower (Rudbeckia maxima) mixed with the mauve flowers of Joe-Pye weed (Eupatorium purpureum 'Little Joe') and the blue flowers of Russian sage (Perovskia atriplicifolia 'Little Spire'). 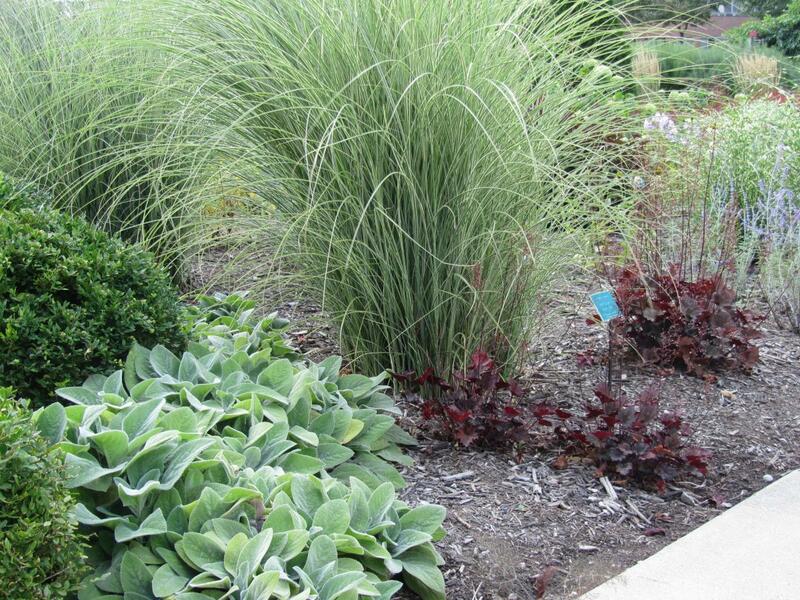 This section of the garden features several striking combinations in a variety of colors. 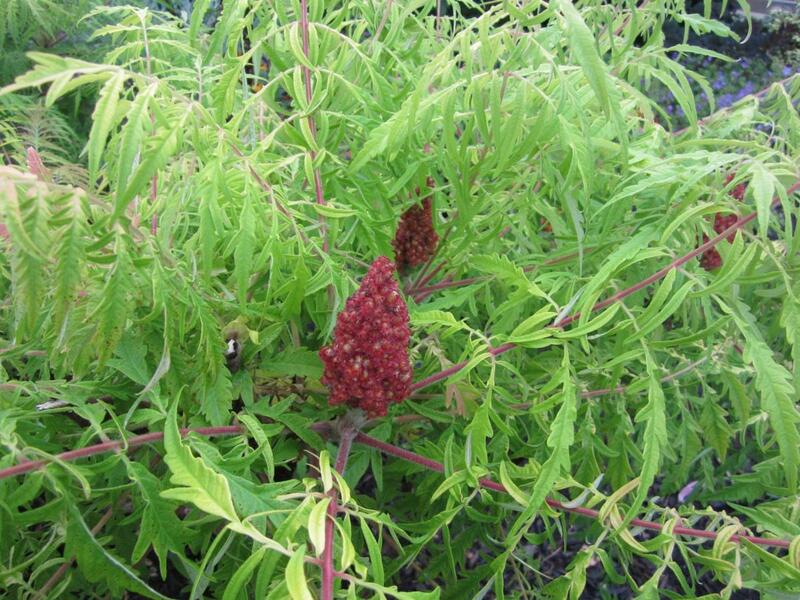 The bright yellow leaves of the staghorn sumac (Rhus typhina 'Tiger Eyes') are colorful during the entire growing season. For a softer look, a pale pink low-maintenance rose, Blushing Knock Out®, has been paired with velvety gray lamb's ears (Stachys byzantina 'Big Ears'). Towards the street side of this section, blue catmint (Nepeta 'Walker's Low') weaves through the soft yellow flowers of moonshine yarrow (Achillea 'Moonshine') during early summer. On the opposite corner, a fine-leaved ornamental grass (Miscanthus sinensis 'Morning Light') is paired with purple coral bells, grey-leaved lamb's ears (Stachys byzantina 'Big Ears'), and boxwood, creating a contrast of light and dark foliage.